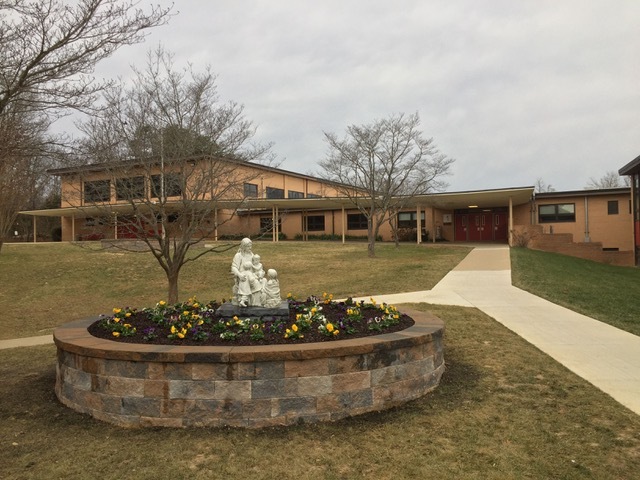 You most likely are aware of the capital improvements that have been completed in the school. By the beginning of schoolyear 2018-2019, we were able to open a new, second Pre-K classroom. This will ensure a more vibrant total enrollment in the school for years to come. Also, we have expanded the administrative spaces in the school to accommodate new offices for staff who previously did not have offices, we added a conference room, upgraded the clinic, principal’s office, faculty break room, front reception office and larger secured entrance. In the last couple of years we have completed many other projects to renew our parish and school community facilities. We excavated and waterproofed be- low-level classrooms for a healthier school environment, remodeled school bathrooms, renovated the commercial kitchen to provide healthy, hot meals for school lunches, replaced all windows in the school and lighting in the administrative area, the gym lobby and the cafeteria. The gym has new lighting, and the gym and cafeteria have new sound systems. All of this, at a cost of $2.2 million, was paid out of parish savings. On these web pages) and the renovation of the Parish Center offices opposite the front doors of the church. The new Parish Center will include an open, welcoming entrance and waiting area, and an elevator that will provide accessibility not only to all floors of the Parish Center, but also access from the lower parking lot to the front doors of the church, bypassing the steps. Knowing the importance of our community’s spiritual growth and providing for our parish’s future, this capital campaign is vital. Therefore, to allow us to celebrate success along the way as we begin addressing these projects as quickly as possible, we will have three goals. At this point, we will have raised enough funds for a parish hall. The original design of the middle school called for a second-floor addition at a future date. This is the perfect location for our approximately 11,000 square foot parish hall. A key feature of the hall is to have partition walls for dividing the hall into four large meeting spaces. The partitioning walls will dis- appear when the larger space is needed. These meeting spaces are a key factor for us to be able offer additional ministry and spirituality growth opportunities. Meeting this goal allows us to continue with the renovation of the former convent where our offices are currently located, and it allows us to return the seed money we borrowed from our reserves to get started. The renovations will create a wel- coming, visible main entrance and waiting area, create a music room for choir rehearsals, provide handicap access to the offices and church with our new elevator, and install an access control and security system to provide better safety for staff and visitors. Meeting or exceeding this goal means you have responded in a truly sacrificial way allowing us to give easier access to our school and new parish hall with the addition of an elevator. Also with this money it is Fr. Don’s dream that solar panels may be added to the roof of the parish hall, to begin to pay the $10K+ monthly electrical bill for the parish.